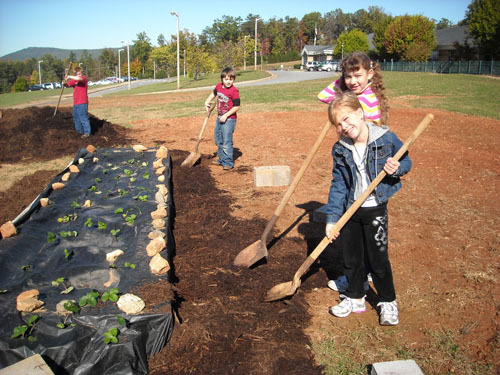 Strawberries in Schools is a collaborative project between NC Cooperative Extension, NC Ag in the Classroom (through NC Farm Bureau), the NC Strawberry Association and teachers throughout the state. Funding provided by the National Ag in the Classroom grant enabled these partners to come together to develop growing resources and lessons that utilize strawberries as model to understand science, literacy and math concepts in a contextual way. 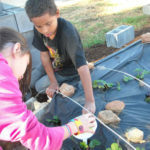 Schoolyard strawberry gardens provide rich spaces for students and teachers to explore concepts relevant to their curricula in a hands-on, experiential way. 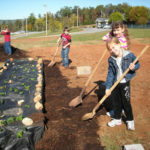 A strawberry garden, modeled on the annual hill production system used by farmers in the southeastern United States, fits neatly into the traditional-year calendar for elementary schools, with students beginning school in late August and finishing the year in June. 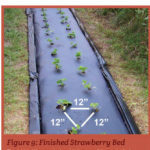 This coincides with the southeastern strawberry production system in which strawberry plants are set into the ground between late September through early October, and the fruit is harvested in late April–early May. This growing schedule enables students to observe the life cycle of the strawberry plant throughout the school year. 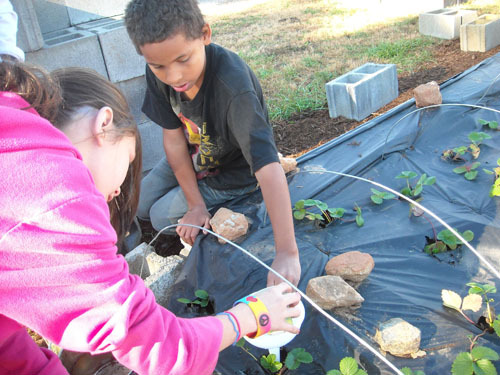 A strawberry garden furnishes numerous benefits for students. The garden becomes a living laboratory, providing an integrated context to explore all subject areas. Science concepts such as plant growth and development can be easily studied and managed. Students can observe and discuss the relationships between plants and animals and their surrounding environments. 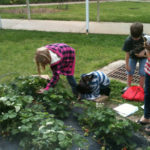 Math, social studies, literacy, and health and wellness objectives can also be taught through the garden, with activities from weighing fruit to learning about the importance of strawberries to North Carolina. Life skills, including critical thinking, responsibility, communication, teamwork, citizenship, and a respect for nature, develop through nurturing a strawberry garden. 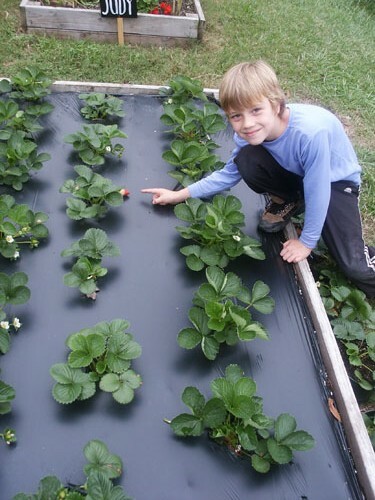 A strawberry garden affords an opportunity for youth who are disconnected from how fruits and vegetables are grown to understand the way food is produced. 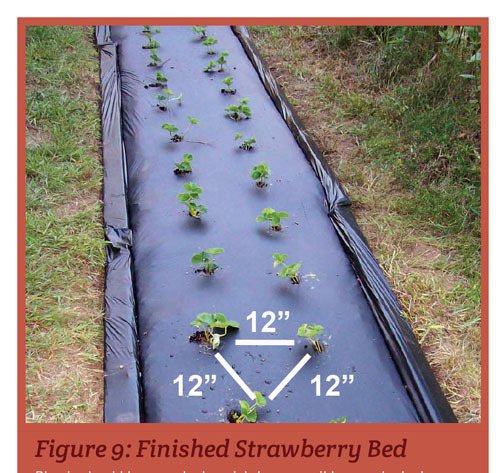 The simple act of cultivating a strawberry plant from a starter plant to a mature fruit-bearing plant imbues students with a proud sense of accomplishment. Tasting fruit fresh from the garden, which students have grown themselves, can encourage a lifetime preference for eating healthy food and a love of gardening. 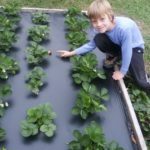 This is the manual that details how to build and maintain a schoolyard strawberry bed through the year. To inform students that strawberries are a type of fruit with many seeds. To learn that strawberries are a fruit that is grown in North Carolina and to learn the different parts of a strawberry. To teach students about runners on a strawberry plant. To teach students that weather is an important factor in growing. To teach students the names and functions of major plant parts (roots, leaves, stems, flowers). 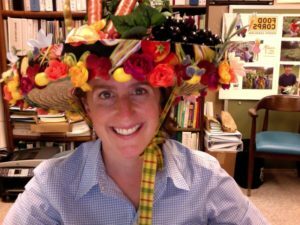 The purpose of this lesson is to inform students about growing, planting and harvesting strawberries in NC by using research. To help students understand the importance of strawberry production in North Carolina and how it relates to the US economy. Students learn how to propagate strawberries in the classroom. 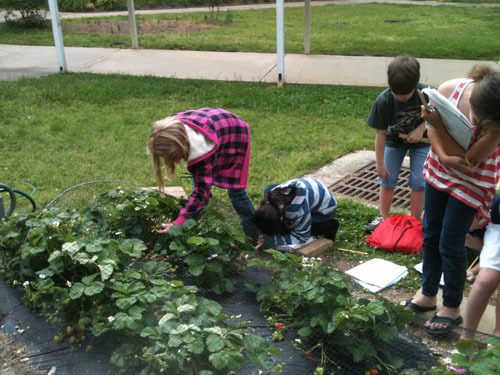 Students explore potential spaces for their strawberry garden. Students set aside plants to “harvest” and observe to monitor plant growth over time.